The mission of Tool Kit Ministries is to multiply workers for God’s kingdom by assisting churches with developing, motivating and nurturing their volunteer workers. 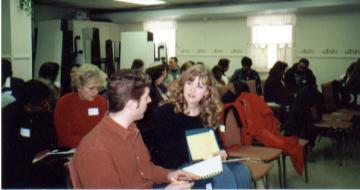 Leadership workshops are specifically designed to meet the unique needs of each ministry. The goal of the workshop is to provide tools for communicating biblical truths and fresh ideas to renew the outreach work of each leader and potential leader. TKM uses demonstrations and hands-on training techniques. The foundation of all workshops is sharing the Gospel with colors. The mission is accomplished through Christian convention workshops and on-site workshops available in half-day or full-day seminars. Write: P.O. Box 1253, Columbia, MD 21044 for more information.